So what does one do when a teeny tiny paypal stash is building? Why, spend it of course, on your favorite web treats! Hence, the arrival of the King Pod quilt cards from Amy. Knew I'd love 'em, and of course, I do. 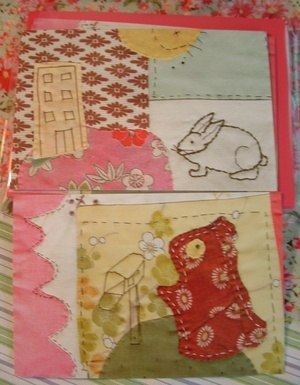 Fabulous cards which only make me want to *touch* one of Amy's quilts even more--ah, the texture!! Do I really have to share these? Or can I hog them all to myself? And then, another order I've been wanting to place for awhile is this one from The Paper Princess, by Leslie of Rubber Sol (a co-survivor of life with three children!). 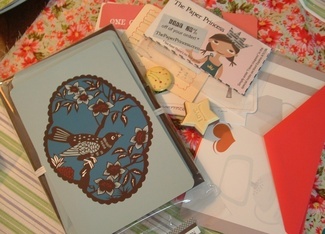 I ordered the "a little birdie told me" cards, and I LOVE them--the color is so vibrant and lovely. She included a few little treats too, including the eraser in the center of the picture that I tried to EAT, even though she included a note telling me NOT to eat it, lol!! 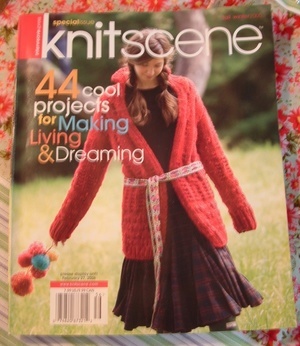 And then...The Crafty Modster was giving away her copy of Knitscene and I happened to be the lucky first respondent, so this just arrived for me! (thank you! Thank you!) I'm digging the patterns in there--I had no idea I was such an instant gratification type of knitter, and this does seem to have a bit lighter patterns that Interweave Knits. In my opinion, it was a brilliant marketing move for them to make this additional mag. The pattern I'm thinking of trying from it is the sweater on the front cover...you know, in all my spare time.